If you’ve been working with TariffShark for a while, you are probably familiar with the shark that swims from time to time in the status bar. 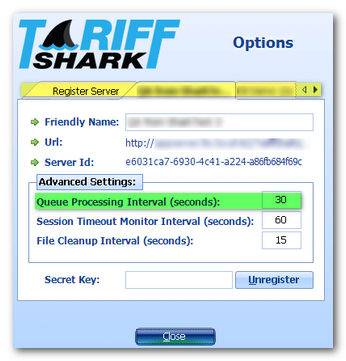 The swimming shark is an indication that the TariffShark software is using your computer to process a Tariff Record Version’s (TRV’s) content in the background. TRV content processing is pretty intense…it does a lot of work. Even though you may have edited and saved the marked version of a TRV’s content, TariffShark actually builds and saves five (5) documents. This work is so intense, in fact, that TariffShark distributes it across all users who are logged into TariffShark. Usually, the shark starts swimming shortly after you save a TRV’s content in Microsoft Word. Sometimes, however, the shark may start swimming even if you haven’t edited a TRV’s content. That happens when your computer is helping out your fellow tariff worker by processing his/her TRV content. It’s worth noting that the shark does not swim to process “whole document” content; it only works on section-based and sheet-based TRVs. The shark tries to use your computer to process TRV content when it’s not being used for other things. However, from time to time, you may be so busy that you just want the shark to SLOW DOWN. After each time the shark swims, he takes a nap (because he gets tired). You can control the duration of his naps to slow him down. The procedure for doing this differs between TariffShark Premier and TariffShark Hammerhead. A toolbar button is provided for the purpose of adjusting the Queue Processing Interval. Click the inverted triangle next to the shark and a slider control appears that allows you to adjust the Queue Processing Interval. When slid all the way to the left, the shark will nap for only 5 seconds between documents that he processes. When slid all the way to the right, the shark will nap for 5 minutes. In addition, clicking the shark icon (just to the left of the inverted triangle) repeatedly will alternate the image between an uncaged shark and a caged shark. When the shark is uncaged (which is the default setting), TariffShark continues to process TRVs in the background at the interval specified. When the shark is caged, TRV content processing is suspended on your desktop. We strongly discourage leaving the shark caged for extended periods as this could cause TRVs to build up in the queue. In TariffShark Premier, click the Options link on the login dialog. On the resulting “Options” dialog screen, click on the tab that corresponds to the server to which you are connected (highlighted yellow below). Then set the “Queue Processing Interval” value to a number between 5 and 300 seconds (highlighted green below). The higher the number you enter, the longer the shark will nap after each time he goes swimming. There’s another way to slow the shark down…by telling him to work on your stuff only. In large organizations, ones that file tariffs for mulitple regulated companies, different groups of people might have responsibility for different companies’ tariffs. The shark’s default behavior is to work on the content of any TRV that belongs to any company. If you find that your shark is spending too much time processing other companies’ TRVs, he can be configured to work on your company only. This is an advanced setting and one that requires the assistance of TariffShark Support. If you think this setting will help you to be more productive, please contact the TariffShark Support team and we will be happy to assist. If you have questions about TRV content processing and the animated shark, we’d love to hear from you. Please comment below or contact Support.